With up to 2,000 runners on course, our number one concern on race day is runner safety, which every year means that we have to plan for a number of road closures and detours at the race start, on the race course, and at the race finish. Please make sure you are aware of our traffic plan and also communicate it to friends and family that are planning to get around the course to support you. 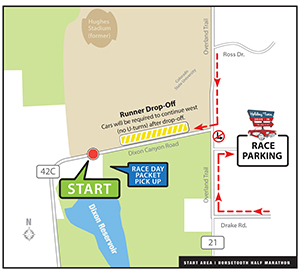 All race morning parking will be at the Holiday Twin Drive In (2206 S Overland Trail). Access to the Holiday Twin parking off Overland Trail Rd will be from the south only (right turn), so plan to access Overland from Drake Road. Parking traffic coming from the north will be required to continue south and turn around at Cottonwood Glen Park. For runner drop-off on Dixon Canyon Dr (42C), access will be from Overland Trail Rd only. All vehicles will be required to access Dixon Canyon Dr from the north (right turn only). After dropping runners, all vehicles will be required to continue west on Dixon Canyon Dr. The south shoulder of Dixon Canyon Dr will be exclusively for pedestrian traffic from the parking lot to the race start. The two drive lanes will be used for runner drop-off, and the north shoulder will be used for thru traffic (westbound). Dixon Canyon Dr will be closed to all eastbound traffic from 7:00am – 8:45am. Southbound traffic from Centennial Dr will be diverted to 38e. Traffic from 38e will be required to turn around or route north on Centennial Dr.
Dixon Canyon Dr will closed to all traffic at 8:15am to allow for the race start at 8:30am. It will reopen after the last runner clears South CR 23 at approximately 8:45am. As noted above, there will be a full road closure for the first 3/4 mile of the course on Dixon Canyon Road (CR 42C) from the race start to South CR 23. From South CR 23 to Bingham Hill Road (mile 6.5), there will be a single lane closure (northbound lane) on Centennial Drive (North CR 23). Flagged two-way traffic will run between South CR 23 & Bingham Hill Rd (50e) on Centennial Dr. Be prepared for up to a 10 minute wait to drive south or north on Centennial Drive. With the exception of local traffic, we advise alternate routes. If planning to spectate on Centennial Dr, we advise bike (or run) access only. The northbound lane closure and flagged two-way traffic on the southbound lane of Centennial Dr (North CR 23) will be in effect from 8:15 – 10:15. On Bingham Hill Road, the westbound lane will be closed from 8:30 – 10:30. Local traffic coming from the east (Overland Trail Rd) will be asked to detour north through Bellvue and approach from the west. 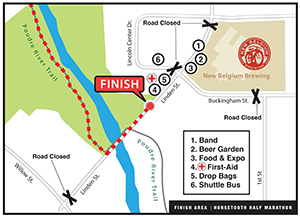 Linden St. will be closed from the Poudre Bike Path to Linden Centre Drive (north) to accommodate the finish and post-race party. Access to Linden Centre Drive parking opposite New Belgium will be from the north via Vine Dr.
Buckingham St. will be closed from 1st Street to Linden. Traffic from Lemay on Buckingham will be for local access only. Detour traffic will use Vine, Lemay and Lincoln.